I only had to give SQL Agent access to my backup directory. Your scripts work like a charm. Thanks! Thanks for this solution! 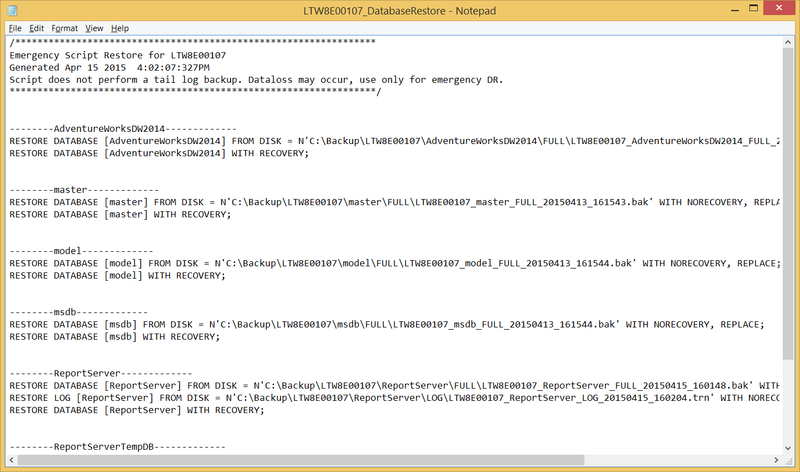 I am testing it out now on a server that uses differential backups. 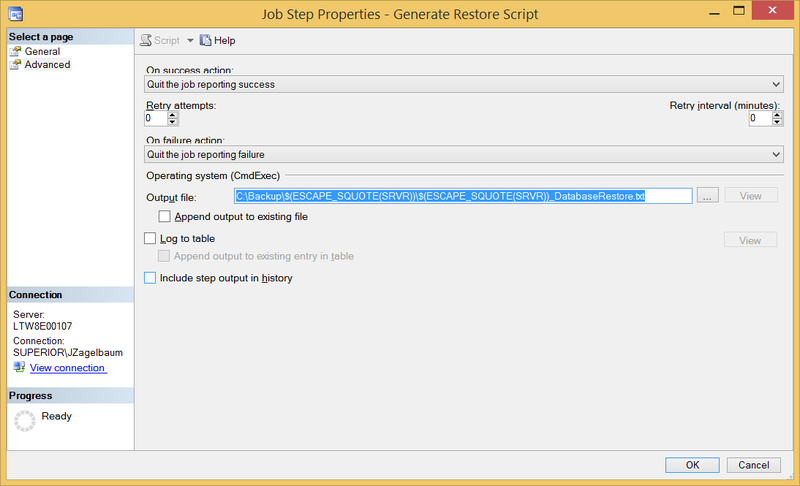 My current solution for generating a restore script doesn’t have the option for diff’s. Hope it meets your needs! So far so good! Thanks again! Thanks for this, Jared. The script doesn’t seem to account for multiple backup files and only will give a restore command for the first of n files. Thanks, John. I haven’t had to account for multiple files before. There’s other supported Ola configs that I’m sure I’m missing as well. Please feel free to extend the script to meet your needs. Thank you! This script was exactly what I needed. The environment I’m working in has Availability Groups, but as long as all replicas back up to the same location, it works. Great script! Quick question. 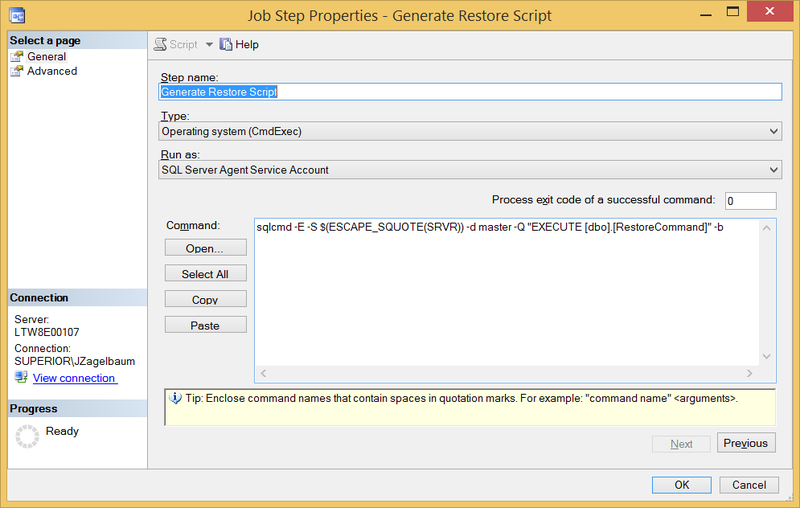 How would you recommend I use your restore script to automatically execute the restore command generated via your restorecommand stored procedure? I would like to use this in conjunction with Ola’s scripts to do a nightly restore to a testing server. Would you simply execute the command that is scripted in your stored procedure and run it through Ola’s CommandExecute stored procedure? 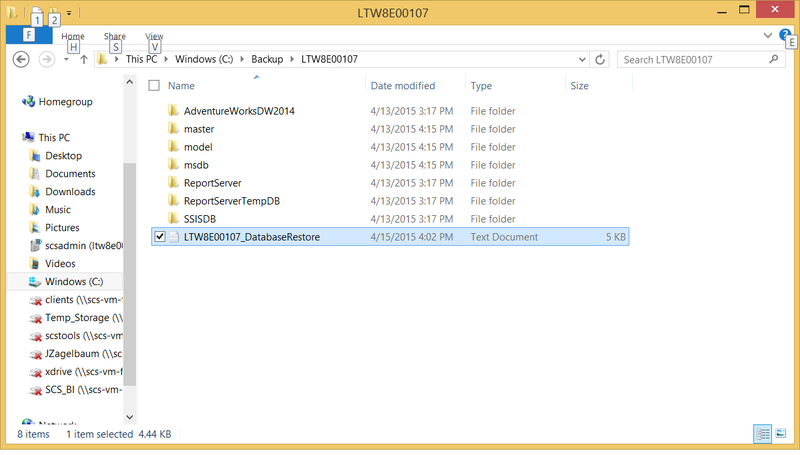 Place the backup files and script in a shared directory. My question back to you would be, perhaps you’d rather consider log shipping for something like this, as the design of the solution is really meant to be a DR scenario. I’m receiving the following error when running the Restore Script File Cleanup job: “Unable to start execution of step 1 (reason: Variable SQLLOGDIR not found). The step failed.”. Any help would be greatly appreciated. Sounds like an instance issue and not necessarily a problem with the script. 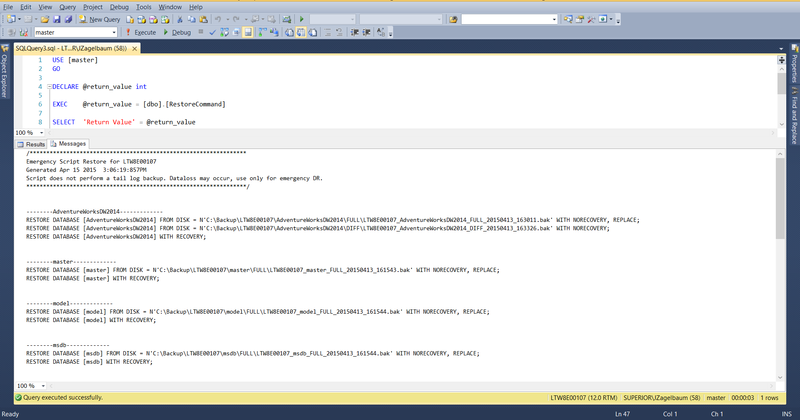 The “Variable SQLLOGDIR not found” error is caused by scripting a SQL Agent job from a later version of SQL Server then running it against older version. 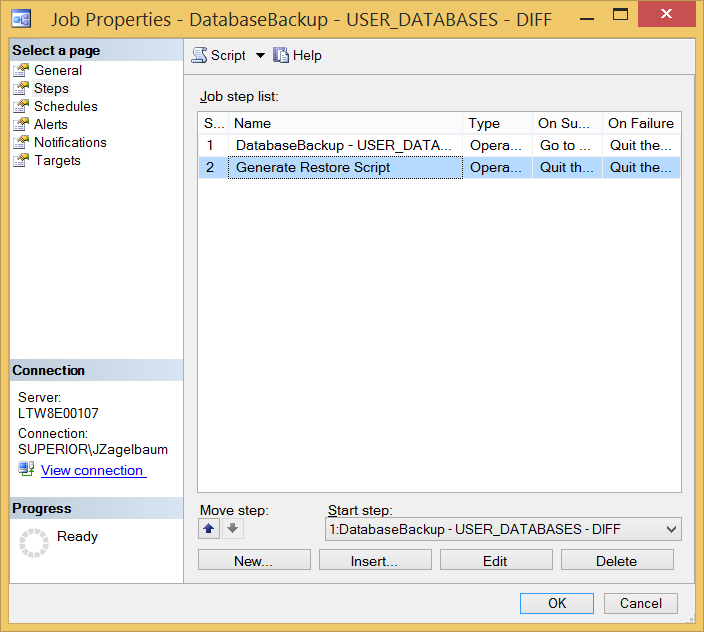 Prevent the issue by either modifying the maintenancesolution.sql file to create the new custom jobs or use one of the sample jobs generated on the older server as a template for new custom jobs. This happened to me when I migrated one of my Ola Hallengren jobs to a SQL Server database that was an older version. In the job step, under ‘Advanced’ the Output file was using the SQLLOGDIR variable which I think only exists from SQL Server 2014 onward. On older versions, Ola’s script creates jobs with steps that log to Output file paths that do not use the SQLLOGDIR variable. I copied the path that one of Ola’s default scripts was using on that older version of SQL Server, and used it in the job I migrated over from a newer SQL Server, and then it worked. Hello, The script is no longer available at http://1drv.ms/1ynGEsV Can you please upload it back. Thank you. Thanks for letting me know! Should be able to access now. but how does it works when you run the logs on secondary replica and Full and diff on primary? Hi There. As Ola scripts are designed to log locally, there isn’t a supported way I know of to log to a dedicated admin instance. Perhaps use a synonym on each instance? This introduces a potential single point of failure and additional licensing if done with HA in mind (which I think would be the point). Otherwise, I would guide you to run all backups (including logs) on the primary if performant enough to avoid the issue of splitting out the command log records. Diverting read workloads to a secondary instance if not already in place might help offset putting log backups on the primary instance. Looking forward to trying this out with Ola’s scripts. Thanks! I believe the problem with SQLLOGDIR is that the SQL Agent token (SQLLOGDIR) does not exist in versions prior to SQL Server 2014. Tim, you nailed it. At least that was my problem. I had scripted the job from a 2014 instance, and installed on 2012 instance. Once I fixed the Output File value on the Advanced tab of the Job Step, I was able to execute job without issue. When I do FULL backups, I create 4 files. The current RestoreCommand scripts was only restoring the first file. My friendly modification to count for multiple files also. Chris, thanks to you too, I was able to use the modified script for multiple files and generate the restore script. What could be the reason to fail from SQL Agent? Hi, got a problem with the output file. The next row after the FULL backup row starts with BAC’ and ends there. What’s the reason? Is the CommandLog record correct for the log file? That would not be handled without altering the RestoreCommand procedure. You can change the completed_ola_backups CTE to search on dif instead of bak for differentials, but you’ll have to add some extra logic there. Does your script work on SQL AG nodes? For example, an AG cluster contains two nodes, primary replica and secondary replica and their role can switch anytime after automatic fail over. Ola’s script is able to handle AG backup now. But can your script handle that too? Thanks. Another question, is that txt file overwritten everytime or it just keeps growing? Thanks.